It might not have been the most successful 500cc Grand Prix bike, but the Suzuki RGV500 captured the hearts and minds of race fans in the late ’80s and early ’90s. And it was all because of one man: Kevin Schwantz. The flamboyant Texan was the Rossi of his day and the smiling assassin was all slides, spins and crossed-up wheelies out of corners - clattering sideways in on the brakes after he’d ‘seen god and backed off’. Not only was Schwantz’s leggy, upright style captivating, the bike he turned up on in 1988 to begin his full time 500cc Grand Prix career was a thing of beauty. 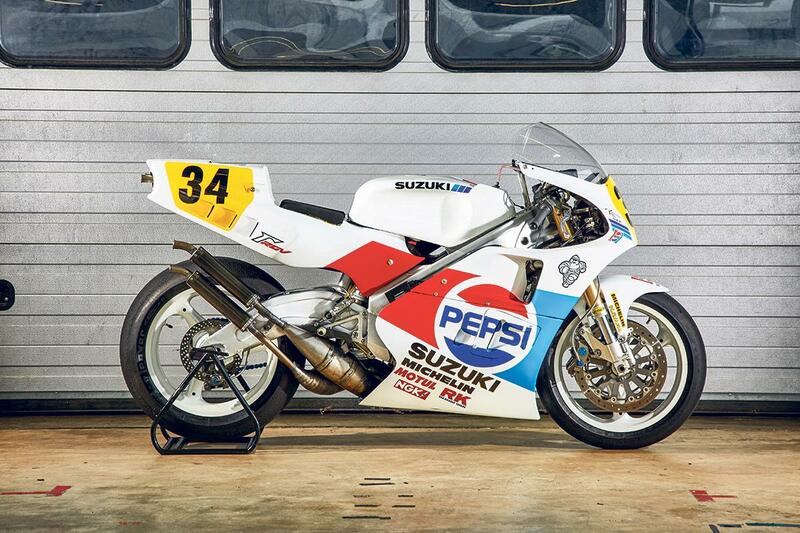 His Pepsi Suzuki was an instant poster bike and even by today’s standards still looks perfect. It didn’t do any harm to the legend of Schwantz and his 160bhp, 115kg RGV500 that they won first time out. Kevin and his Suzuki inspired thousands of race replica Pepsi and Lucky Strike paintjobs on GSX-R road bikes and even more race rep Arais. Suzuki even made an RGV250 road bike, made to look just like Revin Kevin’s, but we never got the full RGV500 road replica we all desired. 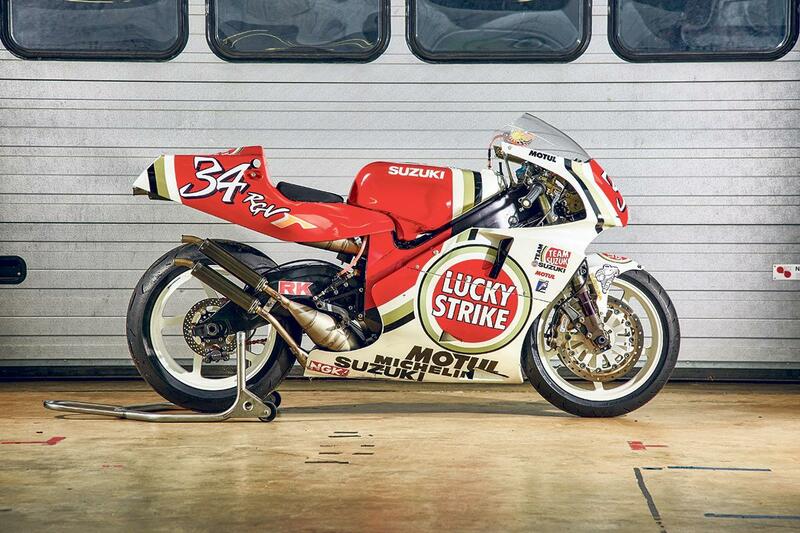 From 1988 to 1993 Schwantz and his RGV500 were part of a golden age of 500cc GP racing. But Kevin quietly walked away midway through 1995, rocked by Wayne Rainey’s life-changing ’93 injury and battered from fighting his fickle Suzuki, which was rarely a match for the Yamaha YZR500 and Honda NSR500. The RGV500 carried on until the end of the 500 era in 2001 and won another world championship in the hands of Kenny Roberts Jnr in 2000. 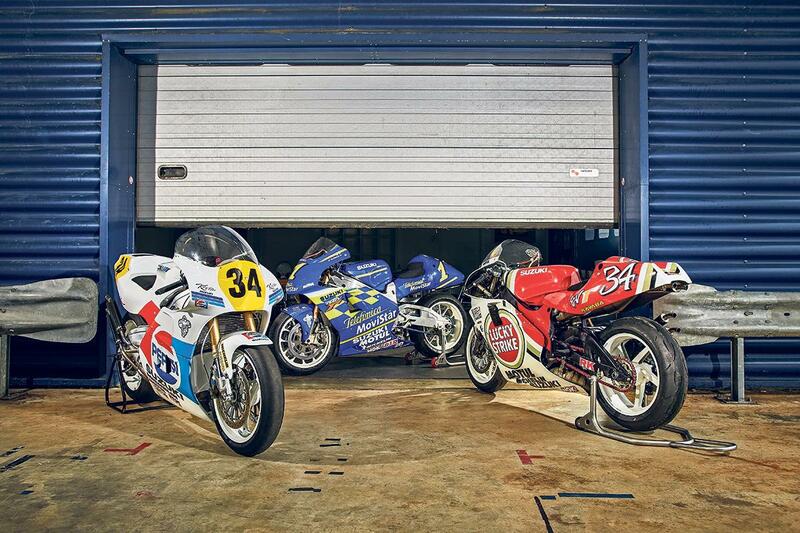 We look at three of the most important RGV500s, kindly loaned to us by collector Steve Wheatman: the 1989 Pepsi, 1994 Lucky Strike and 2000 Telefonica machines. We also talk to GP mechanic Nathan Colombi to find out what makes them tick. Bike collector Steve Wheatman has an enviable collection of ex-factory RGV500s, as well as an ultra-rare RGV250 and a brace of Suzuki WSB machines. He also provided the Team Classic Suzuki XR69 replica that Michael Dunlop used to clinch victory at this year’s Classic TT. Nathan Colombi is the man charged with keeping this collection alive so the RGV500s can be ridden at classic events around the world. Few people outside the Suzuki factory know what makes the RGV500 tick. The bikes are stripped and fettled every time they’re used and parts checked and replaced, as they would’ve been back when they were used in anger. In 1988, Schwantz stunned the GP world by turning up at the opening 500cc race at Suzuka on his lip-smacking Pepsi Suzuki and winning first time out. As their race-long battle reached boiling point, reigning champ Wayne Gardner ran off the track and handed Schwantz the victory on the final lap. This is his 1989 machine, in the Pepsi colours for the last time before it wore Lucky Strike livery in 1990. It’s already a world away from the original 1987 bike and it had to be battling against the likes of Wayne Rainey, Eddie Lawson, Mick Doohan and Wayne Gardner – arguably the most fierce competition ever witnessed in GPs. Nathan says: "Suzuki had got as far as they could with the old square-four RG500, even after they went from disc to reed valves towards the end, to calm the power delivery and soften throttle response. With the carbs on the outside, the engine was not as compact as they wanted it to be. "The natural progression was to go for a V formation and in 1987 the RGV500 was born. With the carbs in the middle of the V, the reed valve engine started to create proper power. By the time Kevin rode the first Pepsi bike in 1988 they’d got the design nailed and it was a steady evolution from there. "The ’88 bike had both crankshafts going the same way, but the problem was that with the carbs in the middle of the engine the crankshaft went the against the intake flow, so the bikes never really had the power. This 1989 RGV has counter-rotating cranks and that’s when they started to create some really good power, but they had a problem with reliability. "Cranks were breaking simply because the bike was creating too much power. Kevin acknowledges that 1989 was his best ever season. He won six races, but he had three mechanical DNFs and three crashes. If he hadn’t had either of those he would’ve won the world championship. "The RGV500 had Suzuki’s first big aluminium beam frame, but the team was changing it all the time, experimenting with different layouts, swingarm pivot positions and steering head angles. "The 1988 bike had conventional Showa suspension and the lower exhausts either side of the bike. But ’89 saw the first incarnation of the banana swingarm, allowing both pipes to come up the right hand side and the first generation Kayaba upside down fork. They raced all season with cast aluminum calipers, but billet versions were in development." Schwantz had never managed to put a consistent season together until 1993 when he finally won the 500cc World Championship. Rainey had always been the stronger of the two rivals over a year, so it was the cruellest irony that the Californian’s life-changing crash at Misano effectively handed Schwantz the title. Without his most fierce sparring partner, Schwantz was never the same again and Mick Doohan went on to dominate 500s for the rest of the decade. This 1994 RGV500 should be wearing that number one plate, but it wears the number 34 from when Schwantz rode it at a classic festival earlier in the year. Nathan says: "Although the engine is a development of those in the early bikes, there were no fundamental changes, so it’s still very similar, although they changed the V angle several times right up to 2001, varying it between 70° and 80°. Other than that it’s just tweaks to carbs and ignition, which is where they found the extra power. "The early Pepsi bikes had a single guillotine exhaust powervalve set-up, but this one has a twin power valve system: a guillotine and rotary, which gave better low down power. It also had a rudimentary quickshifter for the first time. You can see that as they learned more about the chassis it’s a bit neater looking and easier to work on. "They had three or four different chassis in 1994 to suit different circuits. This was the era where the frame had an adjustable steering head angle with different inserts, adjustable offset for the triple clamps and different swingarm pivot and also adjustable ride height positions for the first time. "Suzukis were always known to have fickle handling, but Kevin could notice a millimeter of ride height and it would make a big difference to the bike." 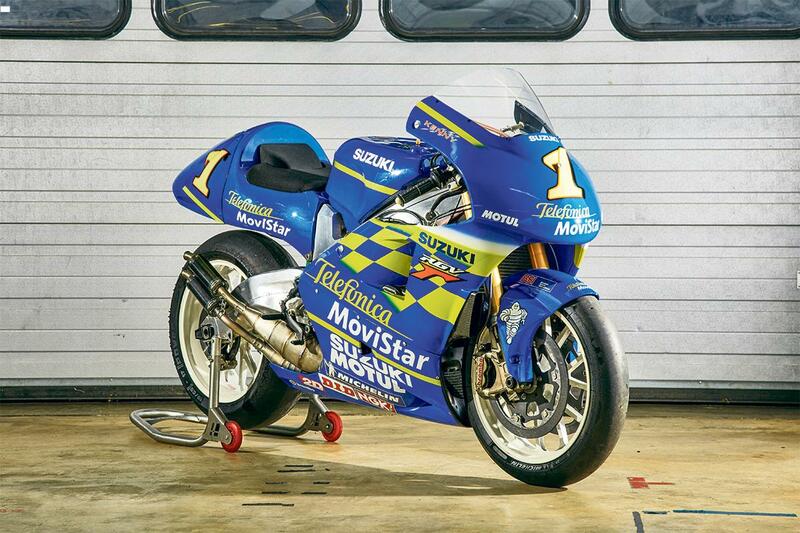 Suzuki came out of its post-Schwantz wilderness years when RGV500-mounted Kenny Roberts Jnr won the world championship at the turn of the new century, just ahead of a young Valentino Rossi in his first year of 500s. Cynics would say 2000 was an easy year, falling between the end of the Doohan era and the beginning of Rossi’s, but the Californian still had to beat the likes of Biaggi, Barros, McCoy, Capirossi, and the Doctor himself. This is Kenny’s championship-winning bike and is almost the last of the breed. The RGV500 was only developed for a year after this before Suzuki campaigned the GSV-R in MotoGP’s inaugural year in 2002. Nathan says: "Kenny won the championship in 2000 carrying the number two plate. The 2001 bike is distinguishable by its orange bellypan carrying Fortuna sponsorship. There were a lot of engine changes in ’01 and the crank was offset slightly for the first time. "Early bikes had a 54mm bore, then a 56mm and from 1997 back down to a 54mm, but with a longer stroke to increase capacity slightly. But the engine architecture is similar and the cassette gearbox is almost interchangeable between much older models. "Over the RGV’s life they went from proper big bang motors, to screamer engines. Two bikes from the same year could have different crankshaft timing – they changed them to suit the tracks, conditions and rider preference. "They had 180°, 90° and 45° cranks. 2000 was the first time they went with the self-supporting carbon fibre subframe and another change in suspension brand, going from Showa to Öhlins. Limited electronics started to creep in with selectable power maps. "The wheel design changed over the years. Early RGV500s had three spokes, but were bending a little, so they went to five spoke Marchesinis in ‘94, and to multi-spoke BBS wheels with the KR bike. From 1998 the bike had Brembo radial-mount calipers."